USDA loan programs are provided to potential home buyers through the United States Department of Agriculture (USDA) to give people in rural communities a chance to become homeowners. It has also been called the USDA Rural Development Loan. The USDA guarantees a mortgage that has been issued by a local bank or lender. This subsidy helps lower the mortgage's interest rates and give the homebuyer the opportunity to have a $0 down payment. We will guide you through the application process, eligibility requirements, how to check your application's status, how to find out if you qualify, rates, and much more. You'll end this article will a very good understanding of the USDA loan program, and you'll have links to check further information if you require it. Before you apply for a home loan through the USDA, you should find out if you're an eligible candidate for this type of loan. Typically, there are two factors that the program takes into account, and they are the property and its location, and the person applying for the loan. Use our USDA loan calculator to figure monthly payments, or view current rates below. Here is a table listing current conforming mortgage rates in your area, which you can use to compare against USDA loans. When you apply for your USDA Home Loan, your lender will check your credit rating, income, and your employment history. However, there are several other factors they will check as well to determine your eligibility. Credit Worthiness. Before you apply for the USDA loan, you want to check your credit score. Ideally, you want one above 640. However, if your credit is lower than that you can still get the loan, you'll just have more steps to follow like taking finance classes before you're approved. You also want no accounts delinquent or in collections for at least 12 months. Citizenship. You must be a U.S. citizen, permanent resident, non-citizen national, or a qualified alien to be eligible. You'll be required to provide proof of your status. Debt-to-Income Ratio. The debt-to-income ratio compares how much pre-tax income you have coming in each month and subtracting all of your financial obligations. The current ratio limit is 29/41. This ratio means that 29% of your pre-tax income can go to interest, insurance, principle, taxes, and HOA dues. The remaining 41% can be used for your loan payment and all of your other bills. Employment. You'll need at least 24 months of steady work to qualify for the USDA home loan. However, if you go to school full time, this can replace a large majority of this time frame without penalizing you. Income Limits. This loan program is designed for lower-income households. The exact amount varies from state to state, but traditionally you'll need to be at or below 115% of your area's regional income. For example, if your area's average local income is $50,000 per year, you could make a maximum of $ 57,500 annually and still meet the income limit. This income limit includes your entire household income, not just the person who is applying. Loan Limits. While there are no set loan limits for the USDA loan, the loan's size is dictated by your income. It will be higher if you have more money to afford a larger payment amount, and lower if you can't afford as much. The home that you wish to purchase must also meet the USDA property eligibility requirements to qualify for this home loan. If the home you want to purchase doesn't follow this criterion, you won't be eligible to get a USDA home loan. Geographic Area. The biggest eligibility requirement is that your home must be located in an area that this program covers. There are several interactive maps on the USDA website that can pinpoint by state, county, and exact address the eligibility. The home typically as to be in a 'rural' area to qualify. This means that most towns or cities with 20,000 people or less qualify as rural. Homes in the countryside outside of city lines also qualify. Occupancy. Any home that you plan to buy with your USDA loan must be your primary residence. This means that you plan to live there for at least a few years. If you want the loan for a rental property, second home, or investment property, it won't be eligible. Property Standards. Your home will have to meet a set of property standards that the USDA defines. They'll send out an appraiser to make sure that the home you're purchasing is worth what you're paying for it. The appraiser will check for any structural problems, and ensure that it is livable. Type of Property. There are only certain standards of homes that are accepted by the USDA for their loan program. It is meant for single-family homes. However, some townhouses and condominiums may be eligible as well under special circumstances. Lenders may not cover manufactured or mobile homes. There are several people that would not be a good fit for this type of loan program. If you want to live close to the downtown area of a city, there are other loan programs. Also, if you have a 20% you can put down on a home, or if you have a higher income threshold for your location, you won't qualify for this loan program. How Does the USDA Home Loan Program Work? The USDA home loan process isn't much different than a traditional mortgage program. The United States Department of Agriculture will guarantee your home loan, but the entire process is handled through a local bank or lender. The USDA will have the final say when it comes to approving your home loan, but your local bank or lender handles this as well. This program aims to help individuals who they deem have the greatest need. This can be an individual or a family that currently doesn't have a safe or sanitary home. The families or individuals also can't afford a traditional mortgage or home loan, and their income is below the low-income line for their location. There are several steps to the USDA loan application process. While it is true that your USDA qualified lender will handle most of the paperwork for you, you have to start the process on your own. It is critical that you do your research before you apply to make sure you're eligible and that you can prove your eligibility criteria. Your credit is a large factor, and you may have to take time to clean up your credit history as much as you can and check your credit before you apply. This can potentially get you better rates, and it will raise your chances of getting approved. Step 1. Find an Approved Lender. When you're ready to begin the application process, you have to find an approved lender. If you can't find your local bank on the list, you can always call the bank and ask. They'll know if they can process USDA loans or not. Step 2. Apply and get Pre-Approved. Once you've found an approved lender, you can apply for the USDA loan at their office. Just like a traditional mortgage, your lender will look at your credit score, income, and your employment information. If you're pre-approved, you'll get a letter in the mail. This letter will help more lenders take you more seriously. Step 3. Start Searching for a Home. When you get your pre-approval letter, you can start looking for homes in the USDA approved areas. You'll know how much home you can afford with your pre-approval letter, and your real estate agent can tailor searches based on that and any other criteria you want. Step 4. Get Your Lender's Approval and Make an Offer. Once you've made an offer on a property, get your lender's full approval. Make sure that your agent knows that you're using a USDA loan so that the seller will pay any clothing costs. They'll do one last check of your qualifications, the USDA loan status, and the property you made an offer on. They'll update your profile will all of this information and submit it to the USDA. Step 5. The USDA Will Sign Off. Your lender will submit your updated loan profile back to the USDA, and they'll double check everything. If everything is in order, they'll give their approval and sign off on the loan. Step 6. Close the Loan. When the USDA signs off on the loan, your lender can begin the closing process on your new home. If your home has problems, they will have to be fixed before the closing process is finished. All of the paperwork will get signed, a closing date will be set, and the loan will go through for payment on your home. The qualification process for the USDA loan takes, on average, two to three weeks more than a traditional mortgage will take. You can expect around 40 days from the contract date to the closing date. Your location can also play a role in how fast the processing time is. Once you've submitted your application, you can either call your lender's office, use loan tracking services, or check the automated email for status updates. The USDA offers three different loan programs for individuals to participate in. Each loan program offers something a little different, and you can see which one suits your needs and qualifications when you start the application process. You will not have a down payment with any of these three loan options. However, they all have different income guidelines you'll have to meet to apply successfully and get approved for. The Farm Labor Housing Loan and Grant is meant to be used to build year-round housing for migrant and seasonal farm workers. The people who qualify for this loan or grant don't qualify for commercial loans at a rate that would allow them to charge a lower rent rate to their workers. Once the housing has been developed, current farm help, disabled or retired farm help, and very low-income families may reside there. If you don't think you'll be able to repay your USDA loans, there are grant programs available through the USDA as well. However, they also come with more restrictions and eligibility requirements you will have to meet to get approval and funding. 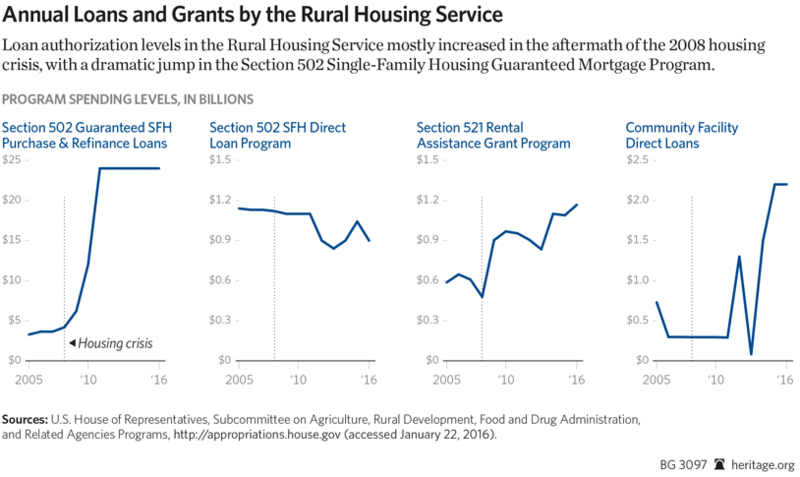 The USDA Home Repair Grant works just like the USDA Improvement Loan. The loan is intended for things that make the home unsafe or unsanitary to occupy. It can be used to either remove things that make your home unsanitary or dangerous or for safety improvements. You have to be low-income and 62 years old or older to qualify for this grant. This grant caps at $7,500, and if you move out of your home within three years of receiving the grant, you'll have to repay it. The Individual and Household Well System Grants are for tribal people or people residing in a Colonia get access to clean water. Depending on which grant you're applying for, you can have only 10,000 or 50,000 residents. They are also only available in certain states or tribal lands. You can use the grant money to extend current lines, pay for the installation and purchase of plumbing features, and construct bathrooms in current homes. While you will most likely end up paying a little more each month with the USDA loan, you won't have to come up with money for a down payment. Also, the less rigid credit requirements make USDA loans a good choice for people who have thin credit histories or lower credit scores. Before 2015, more than 90% of property in the United States was eligible for a USDA loan based on the USDA's definition of rural property. The USDA defines rural property as any town, city, or community that has less than 20,000 residents. In 2015, the USDA updated their boundaries for what defines 'rural,' and this may make it harder to get approved for a USDA loan as populations have grown a lot since 2000. 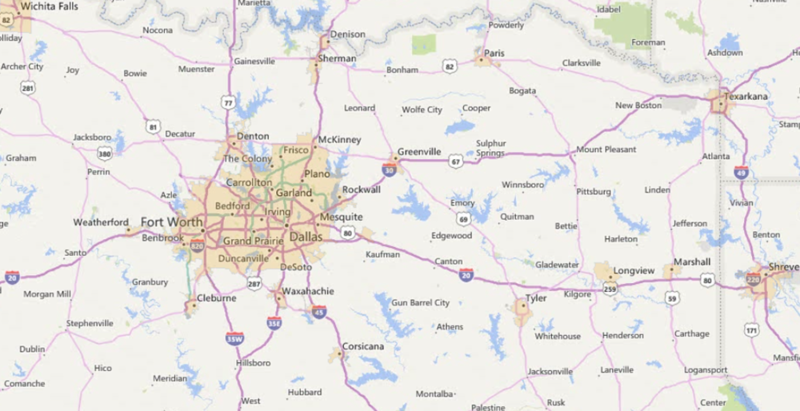 If you want to check the status of your area and find out if the USDA considers it rural or not, there are interactive maps on the USDA site you can check. You put your address or location in, and it'll show you if the area is considered rural or not. Areas which do not qualify show up in tan on the map, but extended portions of metro areas that are in smaller towns & cities may still qualify. Along with the rural definition update in 2015, a few fees changed as well. This loan program charges an upfront fee called a guarantee fee, and this fee allows the USDA to offer the loans they do to the lower to middle-income families and individuals. The guarantee fee dropped from 2.75% to 1% in 2016. The monthly fee dropped from 0.50% to 0.35% as of October 1, 2016. The drop in the guarantee fee can take thousands off of the total loan's balance. For example, anyone who got a home loan worth $200,000 through the USDA program after October 1, 2016, will pay $3,500 less than anyone who got the same loan amount before October 1, 2016. The USDA Home Loan is slowly gaining popularity among individuals and families that are looking to purchase a home. Several popular lenders offer USDA loans, and many of them have an easy online application process with tracking options. Alterra - Fully online application, mobile loan tracking, borrow with nontraditional credit. SunTrust - Easy online application, streamlined loan process, several customer service options. Like everything, the USDA loan program has its downsides as well as all of the positives that come with it. What it comes down to deciding if the USDA loan is the right loan for you and your situation, it is good to have both the good and the bad so you can make an informed choice. This loan program has very restricted income guidelines. It also goes by your entire household income, rather than just the applicant. This can make it harder to get approved for any of the USDA loans if more than one person in your household works or gets any form of income like disability, alimony, or child support. Any USDA loan will take a longer period of time to close. This is because each loan through this program is underwritten twice. The first time it is underwritten is by the lender, and then the bank turns it over to the USDA, and they underwrite it again. This can add anywhere from one to three additional weeks to the closing time. The USDA charges an upfront fee called the guarantee fee, and this is known as a Mortgage Insurance Premium (MIP). Currently, this fee is 1% of the total loan amount, and it is rolled into your monthly payments. You'll pay this when you pay your loan payment, and it stretches over the life of your loan. The USDA loan program is restricted to the areas that the USDA considers to be rural. In 2015 they updated their boundaries for what defines rural, and this can make it harder to get accepted into the program with the areas you want to purchase a property in. 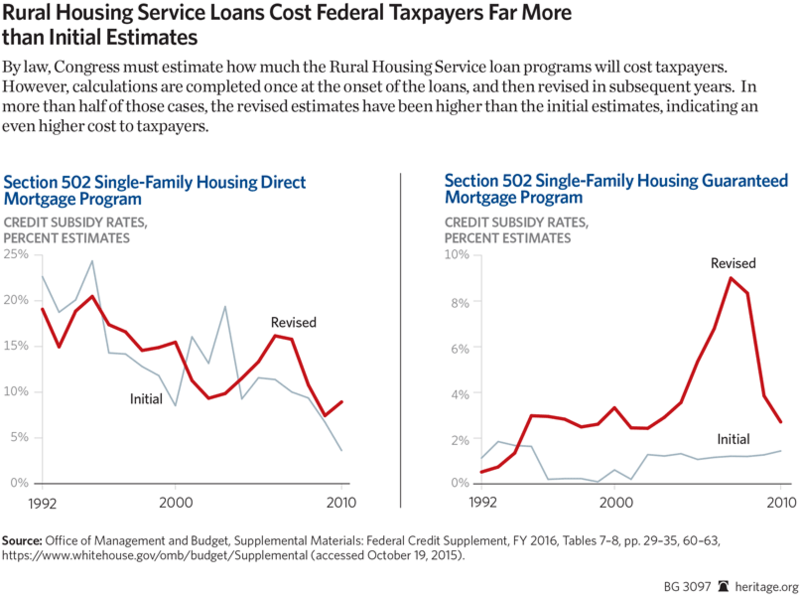 The Heritage Foundation is critical of USDA's Rural Housing Service as "the majority of the RHS loan guarantee programs show a net lifetime budgetary cost for each cohort of loans dating back to FY 1992." USDA lending programs expanded rapidly since the onset of the 2007 recession & the USDA has an existing loan portfolio of $120 billion in single-family & multi-family homes. Here are links to each of the programs available to individuals. Single Family Housing Direct Home Loans: the Section 502 Direct Loan Program provides low- and very-low-income households temporary payment assistance to reduce mortgage payments for a short period of time. Single Family Housing Repair Loans & Grants: the Section 504 Repair Program offers loans to very-low-income homeowners to modernize their homes & grants to very-low-income seniors to remove health & safety hazards. Multi-Family Housing Direct Loans: This program helps people who can not access commercial credit sources financing for affordable multi-family rental housing which serves elderly, disabled & low-income individuals and families. Farm Labor Housing Direct Loans & Grants: This program provides affordable financing to farmers, federally-recognized Tribes, and government entities to develop housing for year-round and migrant or seasonal domestic farm laborers. Individual Water & Wastewater Grants: This program provides grants to households in Arizona, California, New Mexico & Texas which are in a rural area recognized as a Colonia. 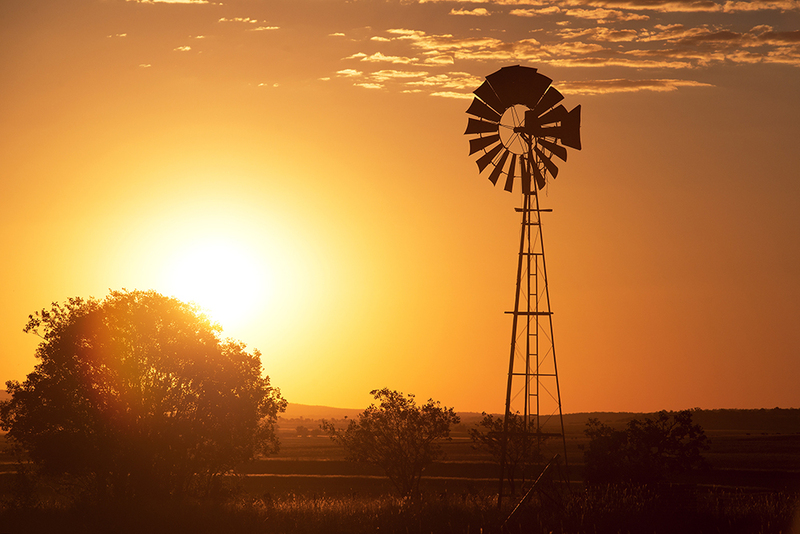 Rural Energy for America Program Renewable Energy Systems & Energy Efficiency Improvement Loans & Grants: This program provides guaranteed financing & grants to help rural small businesses & agriculture producers build renewable energy systems or make energy efficiency improvements. Socially-Disadvantaged Groups Grants: This program provides cooperatives & Cooperative Development Centers funding to provide technical assistance to socially-disadvantaged groups.